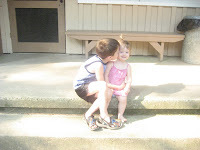 This is Luke and Mikayla on the front steps of our cabin. It was just 5 miles from Santa Claus and was a wonderful campground! 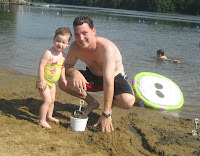 Mikayla and Daddy at the Lake at the campground. She loved playing in the sand! 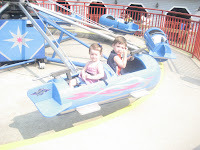 Logan and Mikayla are on a ride together! When did all my kids get so "grown up!?!?!" Luke is waiting in line through the archways in the background. He was with John in line for a roller coaster called the Raven. Luke's now 48" and can go on the adult rides. John said Luke didn't breathe the whole ride! 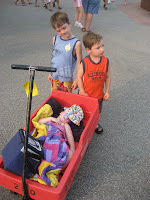 At the end of the day Mikayla was worn out!